How do you find the Back Bay MBTA station? You could look at a map. Or, you could just take a deep breath and follow the acrid odor of diesel fumes. GlobeWatch frequently passes through the station, and wanted to know why such a busy public transportation nexus always seems smoggy and smelling like a row of 18-wheelers is idling inside the station. 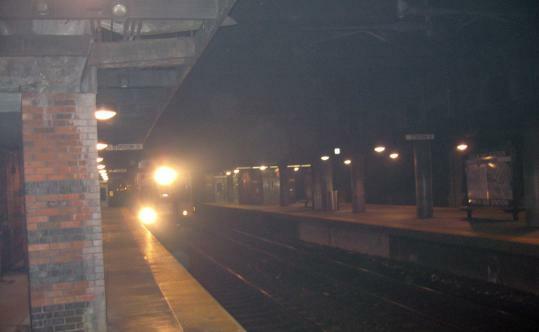 A study published last year by the Boston-based Clean Air Task Force found that the air quality on Platforms 1, 2, and 3 at the Back Bay station, as well as in stairwells and the waiting area leading to those platforms, was being sullied by exhaust from the diesel engines used by the MBTA commuter rail trains. The task force visited the station in late 2006 and then again this past April. "The air was horrible," said Bruce Hill, a senior researcher. "The air was many, many times below air-quality standards." Soot levels measured during the studies were "off the charts high," in some cases greater than could be measured by the devices being used by researchers, he said. The problem, Hill says, is that the roof of the station platforms traps diesel fumes precisely where riders are standing. When train doors open, the dirty air gets sucked into train cars and doesn't dissipate for "quite a while" later. The natural air flow causes fumes to be drawn up the stairwells and into the ticket/lobby area. Hill said the air-ventilation system doesn't adequately filter out diesel fumes and soot particles, making the experience of regularly waiting on the station's commuter rail platforms potentially dangerous for those with respiratory conditions such as asthma and bronchitis or those with other serious health problems like heart disease and lung cancer. "People that are particularly sensitive to air pollution and allergies should avoid Back Bay station because the air is so extreme," he said. A Globe reporter visiting last week found the air relatively clear, but noted the unmistakable odor of diesel permeated the commuter rail platforms, stairwells, and lobby area, even several minutes after a train had left the station. The diesel fumes situation at Back Bay station is well known to T officials, said spokesman Joe Pesaturo. After riders complained about the smog in a 1992 customer survey, the T hired a consultant to study the air problem and recommend improvements. The study, by Stone & Webster, confirmed that there were "elevated" levels of carbon monoxide, formaldehyde, particulates, and oxides of nitrogen, though it noted that there is no regulated standard to meet for indoor air quality in public spaces. Pesaturo said the T took a number of recommended steps, such as making sure train engines are properly maintained, ensuring they stop at the proper location on platforms, adjusting the train schedule to minimize the number in the station at any one time, and enforcing a no-smoking policy. The next step would be to replace the ventilation system, something the T would like to do but cannot. "The T does not have the financial resources to take on a project like this on our own," said Pesaturo. As part of the nearby Columbus Center project, the developer had promised to make "substantial improvements (worth approximately $700,000) to the ventilation system at Back Bay Station," he said. But the shaky financial picture of that $800 million project has delayed - if not derailed - the likelihood there will be a new system anytime soon. "The Columbus Center project is on hold for now, and thus the new ventilation system promised by the developers is on hold too," said Mac Daniel, a Mass. Pike spokesman, via e-mail. Is something broken in your neighborhood? E-mail globewatch@globe.com. Follow up on items at www.boston.com/globewatch.